Before going to Myanmar, you might want to know some things about the country for you to have some ideas about their culture, traditions, and attraction sites. In a usual Burmese dish, the typical ingredients are steamed rice, vegetables, meat, fish, and soup and all are served at the same time. Burmese love using spices which are always present in every meal. Each of them also has their own way of customizing and preparing a dish. They usually roll the rice into a small ball shape using their fingertips and then they will mix it with different dishes. In their tradition, people should not use their left hand for eating as it is used for doing personal hygiene, such as the toilet paper job. You must also know that Muslims don’t eat pork and Buddhist don’t eat beef. When going to Myanmar, make sure you bring with you plenty of cash as there are limited ATMs in the country. You will also get a better exchange rate if you have higher denomination. The minimum exchange rate is about 882 kyat per 1USD. But bear in mind that every cash that you will bring should be clean, not folded, no marks, stains, tears, or creases because even it is a bit worn, it is already worthless in the country. Credit cards will also be a bit useless at the present because it is only accepted in some restaurants, 5-star hotels, and up-market shops and usually with 2-3% charge added to the bill. But the use of credit cards will be accepted more widely by the end of the year. Don’t worry too much about bringing a lot of cash for crime against the foreigners in the country is rare and the Burmese are generally honest where majority of them are Buddhists. Myanmar is a home of some fantastic and finest beaches in Asia, as it has about 2,000km of coastline. In fact there are still lots of beaches along the Adaman Sea and Bengal Bay that are still pristine and not yet discovered by tourists. Most of the beaches found in the country face west giving a nice view on the sunset. The most popular beach in the country is the Ngapali Beach which is about 45-minutes away by plane from Yangon. This beach is about 2 miles long of white sand that is surrounded by palm trees. You will find a number of big resorts in this beach. One of the unspoiled beaches in Myanmar is Ngwe Saung, also known as the Silver Beach. It is not yet fully developed but it is already being visited by locals and tourists. It is 5 hours away from Yangon by car. Ngwe Saung is one the longest beaches found in Asian measuring about 8 miles long. The internet in Myanmar first arrived in 2000 with slow connection and high prices since it is not yet used widely in the country. There are even some websites that were blocked by the former government, like Gmail and Youtube but today, restrictions have already been removed and Eric Schmidt, chairman of Google, have visited the country. Even the uses of mobile phones are now getting popular in the country. But the prices like internet are also high. But the country’s IT firm are now talking of introducing cheaper SIM cards soon. This coming June, a SIM card worth 15USD is coming out, for the coming Southeast Asian Games in December to be held in the country, unfortunately, it will only be available to foreigners. New Year is a big deal for Burmese. Yangon and Mandalay are the cities with biggest celebration. Over the four days of celebrating New Year, every shop is closed, including banks and restaurants. 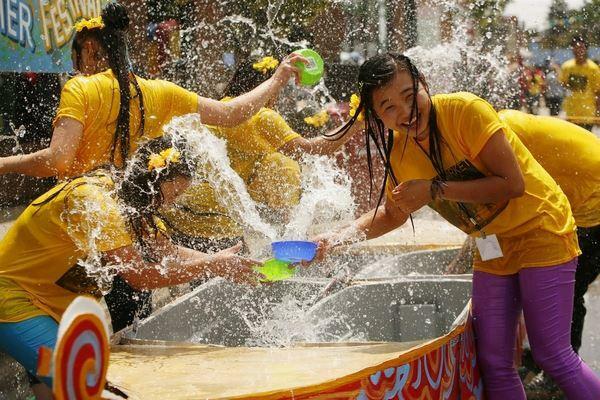 April is the celebration month for their “water throwing festival” or what they call Thingyan. This year, this festival was celebrated last April 13-16. Everyone in the country sprays and throws water at each other during this New Year water throwing festival. They all prefer to get wet as they believe that water washes away their sins and bad luck from the previous year. On the fourth day of festival, which is the New Year’s Day, they release birds and fish as their act of feasts and merit which are held for he monks. Burmese punks usually spiked up their hair every New Year. Before they use leather glue for their Mohawk to stayed up until the water festival but they need to shaved their hair when the party is already over. But today, they already use hair sprays. This kissing sound is like a sound you are making when calling for a cat. Local people usually do this kissing sound to get the attention of a waiter. You will hear this kissing sound a lot down at 19 Street in Chinatown of Yangon. This is usually the place where they come to drink. There are also lots of restaurants here with tables and chairs set out in front of their stores. But don’t expect seeing any females for most Burmese women, single or married, stay home at night. But foreign women are still welcome here. Don’t be surprised if you see men in Myanmar wearing skirt as what they call longyi is the traditional dress of Burmese. It is a wrapped around skirt worn by both men and women but they wear it differently. For women, the cloth is folded over and they secure it at the side while for men, they tie their longyi in the front. Underneath their longyi, it depends on them if what they will use. The men in the cities usually wear underwear under their longyi when they go out but they wear their longyi as how the Scots wear their kilts when they are at home. But underwear is not common in the countryside, for both men and women. If you want to try wearing longyi, it is okay as it is totally acceptable and can even a starter for conversation. Burmese have accumulated their press freedom after a repressive military regime for 5 decades. And now they are enjoying this freedom and they are showing a healthy passion for news. Before, all stories for publications need to be submitted to the Press Scrutiny and Registration Division (PSRD) for approval. But in the year 2012, censorship was evenly phased out and the bureau was officially abolished at the beginning of this year. Before, anyone who will write any obstruction will be put in jail. No journalists were jailed last year and this was the first year since the year 1996 during the time of the former ruling military council. The landmark for Myanmar’s media was April 1 where since 1964, this is the first time that daily newspapers were approved and allowed and it is a big pace for their press freedom. This is because of having a poor condition of their railway tracks. The trains in Myanmar are slow and esteemed for operating late. Trains from Yangon to Mandalay are probably the most reliable route which takes approximately 16 hours if there are no delays. If you will take overnight trains, it more likely better to take the upper class seat than in a sleeper section. Make sure to bring some warmer as it gets really cold after sundown. If you want a faster option, take a bus but they are usually crowded. The most convenient option is via domestic flights, lesser time of travel and comparatively cheap. But if you want to see the country side, trains are still the great option. If you will be traveling today, be aware that the hotel rates have increases their rates as more and more tourists and business travelers are packing to Myanmar since it has opened up. In fact, today’s visitors have already exceeded the number of visitors last year. As a consequence, there is a hotel shortage in the country, though there are more hotels on the way, this shortage is still expected to lasts from 5 to 10 years because they take time to build this new hotels. So if you’re planning for a trip to Myanmar, better book your accommodation well ahead of time and also check if there is a current renovation going on at your selected hotel since many of the hotels in the country are doing some upgrades but they are still open for accommodation, if so, you may request for a room that is far from the noise.